Tim Cook Says Macs, iPads Won’t Converge. Long time readers will know that I’ve long held the belief that OSX and iOS were bound to merge at some point in the future. For me the reasons for thinking this are wide and varied, but it is most easily seen in ever vanishing delineation between the two hardware lines that support them. The iPad Pro was the last volley that iOS launched against its OSX brethren and, for me, was the concrete proof that Apple was looking to merge the two product lines once and for all. Some recent off-hand remarks from CEO Tim Cook convinced many of my line of thinking, enough so that Tim Cook has come out saying that Apple won’t be developing a converged Mac/iPad device. That statement probably shouldn’t come as much of surprise given that Cook called the Surface Book “deluded” just under a week ago. Whilst I can understand that it’s every CEO’s right to have a dig at the competition the commentary from Cook does seem a little naive in this regard. The Surface has shown that there’s a market for a tablet-first laptop hybrid and there’s every reason to expect a laptop first tablet hybrid will meet similar success. Indeed the initial reactions to the Surface Book are overwhelmingly positive so Cook might want to reconsider the rhetoric he’s using on this, especially if they ever start eyeing off creating a competing device like they did with the iPad Pro. The response about non-convergence though is an interesting one. Indeed, as Windows 8 showed, spanning a platform between all types of devices can lead to a whole raft of compromises that leaves nobody happy. However Microsoft has shown that it can be done right with Windows 10 and the Surface Book is their chief demonstrator of how a converged system can work. By distancing himself from the idea that the platforms will never meet in the middle, apart from the handful of integration services that work across both platforms, Cook limits the potential synergy that can be gained from such integration. At the same time I get the feeling that the response might have be born out of the concern he stirred up with his previous comment about not needing a PC any more. He later clarified that as not needing a PC that’s not a Mac since they are apparently not Personal Computers. For fans of the Mac platform this felt like a clear signal that Apple feels PCs are an also ran, something that they keep going in order to endear brand loyalty more than anything else. When you look at the size of the entire Mac business compared to the rest of Apple it certainly looks that way with it making less than 10% of the company’s earnings. For those who use OSX as their platform for creation the consternation about it going away is a real concern. As you can probably tell I don’t entirely believe Tim Cook’s comments on this matter. Whilst no company would want to take an axe to a solid revenue stream like the Mac platform the constant blurring of the lines between the OSX and iOS based product lines makes the future for them seem inevitable. It might not come as a big bang with the two wed in an unholy codebase marriage but over time I feel the lines between what differentiates either product line will be so blurred as to be meaningless. Indeed if the success of Microsoft’s Surface line is anything to go by Apple may have their hand forced in this regard, something that few would have ever expected to see happen to a market leader like Apple. Windows 7 Ceasing Sales Next Year, Windows 10 Rocketing to Replace it. The lukewarm reception that Windows 8 and 8.1 received meant that many customers held steadfast to their Windows 7 installations. Whilst it wasn’t a Vista level catastrophe it was still enough to cement the idea that every other version of Windows was worth skipping. At the same time however it also set the stage for making Windows 7 the new XP, opening up the potential for history to repeat itself many years down the line. This is something that Microsoft is keen to avoid, aggressively pursuing users and corporations alike to upgrade to Windows 10. That strategy appears to be working and Microsoft seems confident enough in the numbers to finally cut the cord with Windows 7, stopping sales of the operating system from October next year. It might sound like a minor point, indeed you haven’t been able to buy most retail versions of Windows 7 for about a year now, however it’s telling about how confident Microsoft is feeling about Windows 10. The decision to cut all versions but Windows 7 Pro from OEM offerings was due to the poor sales of 8/8.1, something which likely wouldn’t be improved with Windows 10 so close to release. The stellar reception that Windows 10 received, passing both of its beleaguered predecessors in under a month, gave Microsoft the confidence it needed put an end date to Windows 7 sales once and for all. Of course this doesn’t mean that the current Windows 7 install base is going anywhere, it still has extended support until 2020. This is a little shorter than XP’s lifecycle was, 11 years vs 13 years, and subsequently Windows 10’s (in its current incanation) current lifespan is set to be shorter again at 10 years. Thankfully this will present fewer challenges to both consumers and enterprises alike, given that they share much of the same codebase under the hood. Still the majority of the growth in the Windows 10 marketshare has likely come from the consumer space rather than the enterprise. This is most certainly the case among gamers with Windows 10 now representing a massive 27.64% of users on the Steam platform. Whilst that might sound unsurprising, PC gamers are the most likely to be on the latest technology, Windows 7 was widely regarded as being one of the best platforms for gaming. Windows 8 (and by extension Windows 10 since most of the criticisms apply to both versions) on the other hand was met with some rather harsh criticism about what it could mean for PC gaming. Of course here we are several years later PC gaming is stronger than ever and gamers are adopting the newer platform in droves. For Microsoft, who’ve gone on record saying that Windows 10 is slated to be the last version of Windows ever, cutting off the flow of previous versions of Windows is critical to ensuring that their current flagship OS reaches critical mass quickly. The early success they’ve seen has given them some momentum however they’ll need an aggressive push over the holiday season in order to overcome the current slump they’re finding themselves in. It’s proven to be popular among early adopters however now comes the hard task of convincing everyone else that it’s worth the trouble of upgrading. The next couple quarters will be telling in that regard and will be key to ensuring Windows 10’s position as the defacto OS for a long time to come. Microsoft Rumoured to be Looking to Acquire AMD. The last decade has not been kind to AMD. It used to be a company that was readily comparable to Intel in almost every way, having much the same infrastructure (including chip fabs) whilst producing products that were readily comparable. Today however they’re really only competitive in the low end space, surviving mostly on revenues from the sales of both of the current generation of games consoles. Now with their market cap hovering at the $1.5 billion mark rumours are beginning to swirl about a potential takeover bid, something numerous companies could do at such a cheap price. The latest rumours point towards Microsoft and, in my humble opinion, an acquisition from them would be a mixed bag for both involved. The rumour surfaced from an article on Fudzilla citing “industry sources” on the matter, so there’s potential that this will amount to nothing more than just a rumour. Still talks of an AMD acquisition by another company have been swirling for some time now however so the idea isn’t exactly new. Indeed AMD’s steadily declining stock price, one that has failed to recover ever since its peak shortly after it spun off Global Foundries, has made this a possibility for some time now. A buyer hasn’t been forthcoming however but let’s entertain the idea that Microsoft is interested to see where it leads us. As Microsoft begins to expand itself further into the devices market there’s some of potential in owning the chip design process. They’re already using an AMD chip for the current generation console and, with total control over the chip design process, there’s every chance that they’d use one for a future device. There’s similar potential for the Surface however AMD has never been the greatest player in the low power space, so there’d likely need to be some innovation on their part to make that happen. Additionally there’s no real solid offering from AMD in the mobile space, ruling out their use in the Lumia line of devices. Based just on chips alone I don’t think Microsoft would go for it, especially with the x86 licensing deal that the previous article I linked to mentions. Always of interest to any party though will be AMD’s warchest of patents, some 10,000 of them. Whilst the revenue from said patents isn’t substantial (at least I can’t find any solid figures on it, which means it isn’t much) they always have value when the lawsuits start coming down. For a company that has billions sitting in reserve those patents might well be worth AMD’s market cap, even with a hefty premium on top of it. If that’s the only value that an acquisition will offer however I can’t imagine AMD, as a company, sticking around for long afterwards unfortunately. Of course neither company has commented on the rumour and, as of yet, there isn’t any other sources confirming this rumour. Considering the rather murky value proposition that such an acquisition offers both companies I honestly have trouble believing it myself. Still the idea of AMD getting taken over seems to come up more often than it used to so I wouldn’t put it past them courting offers from anyone and everyone that will hear them. Suffice to say AMD has been in need of a saviour for some time now, it might just not end up being Microsoft at this point. iPad Pro: Imitation is the Most Sincere Form of Flattery. Apple are the kings of taking what appears to be failed product ideas and turning them into gold mines. The iPhone took the smartphone market from a niche market of the geeky and technical elite into a worldwide sensation that continues today. The iPad managed to make tablet computing popular, even after both Apple and Microsoft tried to crack the elusive market. However the last few years haven’t seen a repeat of those moments with the last attempt, the Apple Watch, failing to become the sensation many believed it would be. Indeed their latest attempt, the iPad Pro and its host of attachments, feels like simple mimicry more than anything else. The iPad Pro is a not-quite 13″ device that’s sporting all the features you’d expect in a device of that class. Apple mentions that the new 64bit A9X chip that’s powering it is “desktop class” able to bring a 1.8X CPU performance and 2X graphics performance improvement over the previous iPad Air 2. There’s also the huge display which allows you to run two iPad applications side by side, apparently with no compromises on experience. Alongside the iPad Pro Apple has released two accessories: the smart keyboard, which makes use of the new connector on the side of the iPad, and the Apple Pencil, an active stylus. Whilst all these things would make you think it was a laptop replacement it’s running iOS, meaning it’s still in the same category as its lower powered brethren. If this is all sounding strangely familiar to you it’s because they’re basically selling an iOS version of the Surface Pro. Now there’s nothing wrong with copying competitors, all the big players have been doing that for so long that even the courts struggle to agree on who was there first, however the iPad Pro feels like a desperate attempt to capture the Surface Pro’s market. Many analysts lump the Surface and the iPad into the same category however that’s not really the case: the iPad is a tablet and the Surface is a laptop replacement. If you compare the Surface Pro to the Macbook though you can see why Apple created the iPad Pro, their total Mac sales are on the order of $6 billion spread across no less than 7 different hardware lines. Microsoft’s Surface on the other hand has made $1 billion in a quarter from just the Surface alone, a significant chunk of sales that I doubt Apple has managed to make with just the Macbook alone. Thus they bring out a competitor that is almost a blow for blow replica of its main competitor. However the problem with the iPad Pro isn’t the mimicry, it’s the last step they didn’t take to make the copy complete: putting a desktop OS on it. Whilst it’s clear that Apple’s plan is to eventually unify their whole range of products under the iOS banner not putting the iPad Pro on OSX puts it at a significant disadvantage. Sure the hardware is slightly better than the Surface is but that’s all for naught if you can’t do anything with it. Sure there’s a few apps on there but iOS, and the products that it’s based on, have always been focused on consumption rather than production. OSX on the other hand is an operating system focused on productivity, something that the iPad Pro needs in order to realise its full potential. It’s either that or iOS needs to see some significant rework in order to make the iPad Pro the laptop replacement that the Surface Pro is. It’s clear that Apple needs to do something in order to re-energize the iPad market, with the sales figures being down both in current quarters and year on year, however I don’t believe that the iPad Pro will do it for them. The new ultra slim Macbook has already cannibalized part of the iPad’s market and this new iPad Pro is going to end up playing in the same space. However for those seeking some form of portable desktop environment in the Apple ecosystem I’m failing to see why you’d choose an iPad Pro over the Macbook. Had they gone with OSX the value proposition would’ve been far more clear however this feels like a token attempt to capture the Surface Pro market and I just don’t think it will work out. Windows 10: Much The Same, and That’s Just Fine. New Windows releases bring with them a bevy of new features, use cases and controversy. Indeed I can think back to every new Windows release dating back to Windows 95 and there was always something that set off a furor, whether it was UI changes or compatibility issues. For us technical folk though a new version of Windows brings with it opportunity, to experiment with the latest tech and dream about where we’ll take it. For the last month I’ve been using Windows 10 on my home machines and, honestly, whilst it feels much like its Windows 8.1 predecessor I don’t think that’s entirely a bad thing. Visually Windows 10 is a big departure from its 8 and 8.1 predecessors as, for any non-tablet device, the full screen metro app tray is gone, replaced with a more familiar start menu. The full screen option is still there however, hiding in the notifications area under the guise of Tablet Mode, and for transformer or tablet style devices this will be the default option. The flat aesthetic has been taken even further again with all the iconography being reworked, ironing out almost any 3D element. You’re also not allowed to change the login screen’s laser window background without the aid of a resource hacker, likely due to the extreme amount of effort that went into creating the image. For most, especially those who didn’t jump in the Windows 8 bandwagon, the navigation of the start menu will familiar although I must admit after the years I’ve spent with its predecessor it’s taken some getting used to. Whilst the charms menu might have disappeared the essence of it appears throughout Windows 10, mostly in the form of settings panels like Network Settings. For the most part they do make the routine tasks easier, like selecting a wifi network, however once things get complicated (like if you have say 2 wireless adapters) then you’re going to have to root around a little bit to find what you’re looking for. It is a slightly better system than what Windows 8 had, however. To give myself the full Windows 10 experience I installed it on 2 different machines in 2 different ways. The first was a clean install on the laptop you see above (my trusty ASUS Zenbook UX32V) and that went along without a hitch. For those familiar with the Windows 8 style installer there’s not much to write home about here as it’s near identical to the previous installers. The second install was an upgrade on my main machine as, funnily enough, I had it on good word that the upgrade process was actually quite useable. As it turns out it is as pretty much everything came across without a hitch. The only hiccup came from my audio drivers not working correctly (seemed to default to digital out and wouldn’t let me change it) however a reinstall of the latest drivers fixed everything. In terms of features there’s really not much in the way of things I’d consider “must haves” however that’s likely because I’ve been using many of those features since Windows 8 was first released. There are some interesting little additions however like the games features that allow you to stream, record and capture screenshots for all DirectX games (something which Windows will remind you about when you start them up). Microsoft Edge is also astonishingly fast and quite useable however since it’s so new the lack of extensions for it have precluded me from using it extensively. Interestingly Internet Explorer still makes an appearance in Windows 10, obviously for those corporate applications that continue to require it. Under the hood there’s a bevy of changes (which I won’t bore you with here) however the most interesting thing about them is the way Windows 10 is structured for improvements going forward. You see Windows 10 is currently slated to be the last major release of Windows ever but this doesn’t mean that it will remain stagnant. Instead new features will be released incrementally on a much more frequent basis. Indeed the roadmaps I’ve seen show that there are several major releases planned in the not too distant future and indeed if you want a peek at the them all you need to do is sign up for the Windows Insider program. Such a strategy could reap a lot of benefits, especially for organisations seeking to avoid the heartache of Windows version upgrades in the future. All in all Windows 10 is pretty much what I expected it to be. It has the best parts of Windows 7 and 8 and mashed together into a cohesive whole that should appease the majority of Windows users. Sure there are some things that some won’t like, the privacy settings being chief among them, however they’re at least solvable issues rather than showstoppers like Vista’s compatibility or 8’s metro interface. Whether Microsoft’s strategy of no more major versions ever is tenable or not is something we’ll have to see over the coming years but at the very least they’ve got a strong base with which to build from. 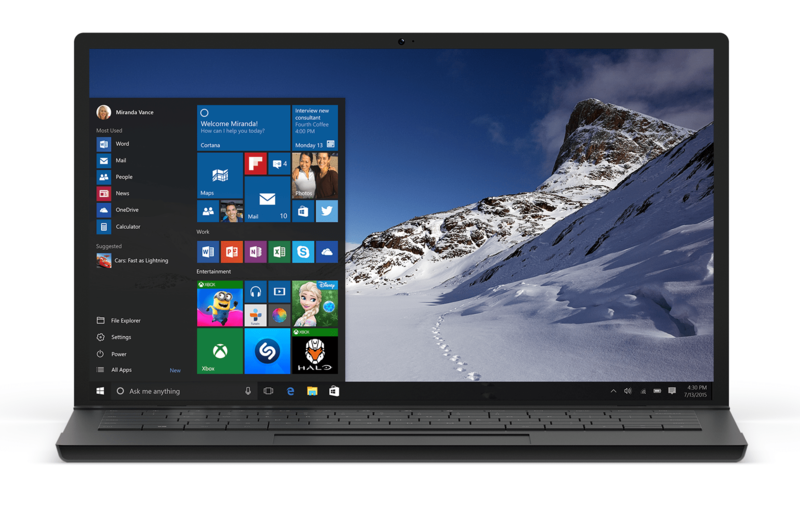 Windows 10: Coming July 29th. The date for the final version of Windows has been set: July 29 of this year. The announcement comes as a shock to no one, Microsoft had repeatedly committed to making Windows 10 generally available sometime this year, however the timing is far more aggressive than I would have expected. The Windows Insider program was going along well although the indications were that most of the builds still had a decidedly beta feel to them along with many features being missing. Indeed the latest build was released just three days ago indicating that a full release was still some time away. Microsoft isn’t one to give soft dates, especially for their flagship OS, so we can take the July 29 date as gospel from here on out. Since everyone in the Insider program has had their hands on Windows 10 for some time now the list of features likely won’t surprise you however there were a few things that caught my eye in Microsoft’s announcement post. By the looks of it Office 2016 will be released alongside the new version of Windows including a new universal app version that’s geared towards touch devices. Considering how clumsy the desktop Office products felt on touch screens this is a welcome addition for tablet and transformer devices although I’d hazard a guess that the desktop version will still be the preferred one for many. What’s really interesting though is that OneNote and Outlook, long considered staples of the Office suite by many, will now be included in the base version of Windows for free. It’s not a big of an upset as including say Word or Excel would be but still an unexpected move none-the-less. Many of the decidedly lacklustre default metro apps will get some new life breathed into them with an update to the universal app platform. On the surface this removes their irritating “takes over your entire desktop when launched” behaviour and makes them behave a lot more like a traditional app. Whether or not they’ll be improved to the point of usable beyond that is something that I’ll have to wait and see although I do have to admit that some of the built in apps (like the PDF reader) were quite useful to have. How the well integration between those apps, the cloud and other devices that can run universal apps, works remains to be seen although I’ve heard positive things about this experience in the past. It seems that Microsoft has had this date in mind for some time now as all my home Windows 8.1 installs last night chirped up with a “Reserve your free Windows 10!” pop up late last night. This is the realisation of the promise Microsoft made back at the start of the year to provide a free Windows 10 update to all current consumer level customers, something I thought would likely be handled through a redemption portal or similar. However, based on the success Microsoft had in getting people to upgrade from 8 to 8.1 with a similar notification, I can see why they’ve taken this approach as it’s far more likely to get people upgrading than a free Windows 10 serial would. What will be truly interesting to see is if the pattern of adoption continues with major Windows versions. Windows 7, which is now approaching middle age, still remains unchallenged by the previous two upstarts. The barriers to transitioning are now much lower than they once were, however customers have shown that familiarity is something they value above nearly everything else. Windows 10 has all the makings of a Windows version that consumers want but we all know that what people say they want and what they actually want are two different things.